Galen “Chief” Tyrol has served aboard the Battlestar Galactica with honor ever since the Cylons attack on the Colonies left humanity on the brink of extinction. Though initially suspicious of the Cylons due to his relationship with Boomer, a Cylon sleeper agent, recent events make his true loyalties unclear. 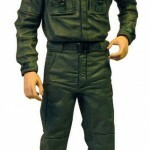 Battlestar Galactica Series 1 figures feature multiple points of articulation and is set in 7″ scale.